Lanigan Elementary School recently celebrate dozens of students who have met or exceeded goals and displayed perseverance. Students at Lanigan Elementary who have been on a roll with achieving goals were recently honored during a school-wide assembly. 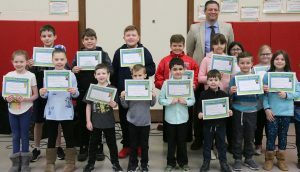 During a school-wide assembly, the honorees received certificates of recognition from Principal Jeff Hendrickson for their hard work and accomplishments. Hendrickson read a brief description of why each On-a-Roll awardee was selected by their classroom teacher for the honor. Students were recognized because they put forth their best effort, crushed goals, increased class participation, challenged themselves and improved reading efforts, among other examples. On-a-Roll awardees include: Mitchell Shurtleff, Anthony Knopp, Ian Daniels, Colin Ware, Shamar Thomas Clark, Claire Briggs, Sydney Osborne, Liany Lancto, Kloey Merritt, Sophie Kunzwiler, Katie Wettering, JamesClark, Jr., Cameron Trail, Mason Perkins, Gage Tetro, Cassanova Hosein, Dylan Reed, Hunter Holbrook and Gavin Terpening. Lanigan Elementary School model awardees show off their certificates after they were honored because they exhibited perseverance. Also honored were several students who exhibited perseverance, including staying with a task and not giving up. Hendrickson said all Lanigan students can persevere through any challenge. Role model certificates were awarded to the following students: Abby Pierce, Indiana Griffin, Aliana Vazquez, Susanna Horning, Nathan Nichols, Sahara Raymond, James Stewart, Sydney Osborne, Koby Drake, Claire Dempsey, Madyson Holley, Earl Hoffmann, Addison Barrick, Matthew Becker, Jaylee Brien-Waldron, Hunter Hofmann, Sophia Hotchkiss, Cloe McLoughlin, Elliot Prusinowski, Jordan Roach, Mckayla Quimby, Savannah Emmons, Hayden Terpening, Alaina Stuart, Nataliyah Monahan, Angel Lamar, Jocilyn Bellinger, Skye Spears, Oliver Clark, Devon Jenney-Kraus, Ryland Sellin, Michael Baldwin, Leland Davis, Nisha Adams, Blake Bartosek, Lillian Francisco, Chloe Tucci, Devante Stewart, Jean Chappell and Jake Fluent.